Designed by architect George W. Maher. 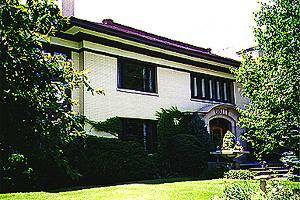 This large and expensive house was the last commision by Maher in Oak Park, and summarizes Maher's strengths and weaknesses. It bears obvious similarities to Maher's design for the celebrated "Pleasant Home" More interesting is the observation that while Maher and Wright were contemporaries in the implementation of the Prairie style, this building shows repetion and synthesis by Maher of his earlier styles, while Wright was embarking on the innovative designs for Midway Gardens, which gave us the wonderful "Garden Sprite" (among other things.) But the most pressing question for the Blader is what does it say over the door?